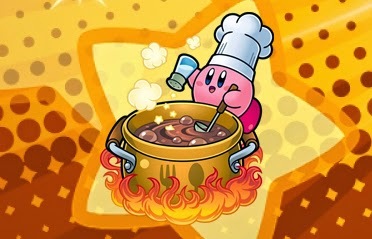 Kirby: The best chef in video games. On your lunch break? Starving for a mouth-watering podcast to sink your teeth into? Look no further! This week on the EXP Podcast, Scott and I head to the kitchen to discuss food in games. We round out the podcast at our usual thirty-minute mark, but there is a bounty of food topics to discuss in games. What are your favorite hunger mechanics? What are the most effective examples of eating in games? What is your favorite game that features food and why is it Chronotrigger? Let us know in the comments below! I like Minecraft's food mechanics. If your food meter is full, you will slowly regenerate health, so you can shrug off minor injuries or even recover from big hits gradually. But if you don't eat, the regeneration will first stop and eventually reverse itself, reducing you to one health point. Plus, the running mechanics are also tied to food. If you're starving you cannot run, so you will be weaker and more easily caught by enemies. Plus there is a subtle animation where your meters will vibrate to simulate pangs of hunger. An everpresent annoyance that makes it impossible to ignore your sorry state. I also like how it makes animal husbandry and agriculture into natural upgrades to your initially hunting-gathering life. Moving around and trying to find food also makes you hungry, but a field or a small herd of animals in a pen will not only feed you, they'll let you build a surplus of food. And that surplus will let you spend a larger proportion of your time on everything else. Minecraft! How could we forget? I love the idea that the game rewards concocting reliable sources of food. You could easily just always be on the move, but ridding yourself of the hunger-gatherer lifestyle in game really does unlock the power to build amazing stuff. Thanks for the shoutout, you guys! I am really enjoying all of this conversation about food in games across different sites. I remember the rationing scene in the Walking Dead (Season 1 Episode 2, I think) being quite compelling. And to add to your comments on Earthbound, I remember how Hamburgers are a recovery item for one person, whereas the Pizza is a recovery item for the entire party -- it is a social food, after all! Out pleasure. Keep up the good work! Kids eat first. Them's the rule. That's some straight up procedural rhetoric right there. And thank you for listening! Earthbound is a pretty special game. I don't think I appreciated it when I first played it, but there are just so many little touches. Great pull! Interesting podcast.I agree with what you both say. I sometimes feel hungry when food appears in games and the eating face of character especially in Harvest Moon. This games focuses more on the food system. You can cook a variety of food by choosing the ingredients provided. Every time I cook using this application, I become hungry because it shows delicious looking food by eating the face of the character. In this game, different food have different effect, but most of the food can increase physical strength. I like Monster Hunter food system. You can go fishing and collect meat by hunting some small size monster and then BBQ in your farm or in mission. When looking at the character's eating face, it is easily makes you feel hungry. The character eats very fast speed and show out the satisfying emotion after eating by beat belly. But usually players will spend more time to prepare ingredients. Usually food system is use to recover the HP of character but it also show the feeling of the characters. Like Dead Rising, even character is recovering HP, but it is show hunger by the quality of eating and eating different foods like pizza, burger, bread and so on. drinking potion or consume herb! !